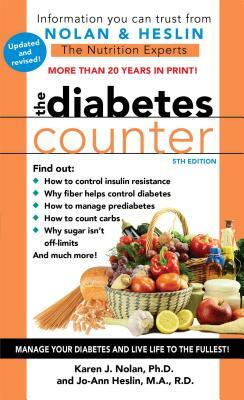 Living with type 2 diabetes doesn’t have to be complicated—let the nutrition experts help you figure out which foods to eat with this fully updated and revised edition of the popular book in the hugely successful food counter series. More than 7.5 million Counter Books in print from the nutrition experts! What can I eat, now that I have diabetes? In short—everything. For more than twenty years, The Diabetes Counter has been helping people with type 2 diabetes and prediabetes control their blood sugar without sacrificing the foods they love. Karen J. Nolan, PhD, holds advanced degrees in science and human anatomy. She is the coauthor of ten books on nutrition. For more information, visit: TheNutritionExperts.com. Jo-Ann Heslin, MA, RD, is a professionally trained, registered dietitian and also a regular columnist for HealthNewsDigest.com. She is the coauthor of more than thirty books on nutrition. For more information, visit: TheNutritionExperts.com.